Signs of spring are evident in my yard. The outside temperatures may not be cooperating, but the daffodils grow taller each day. Soon their yellow cups will bloom. Snowdrops and crocuses display colors of white, yellow, and purple. The tulips push through the soil too. 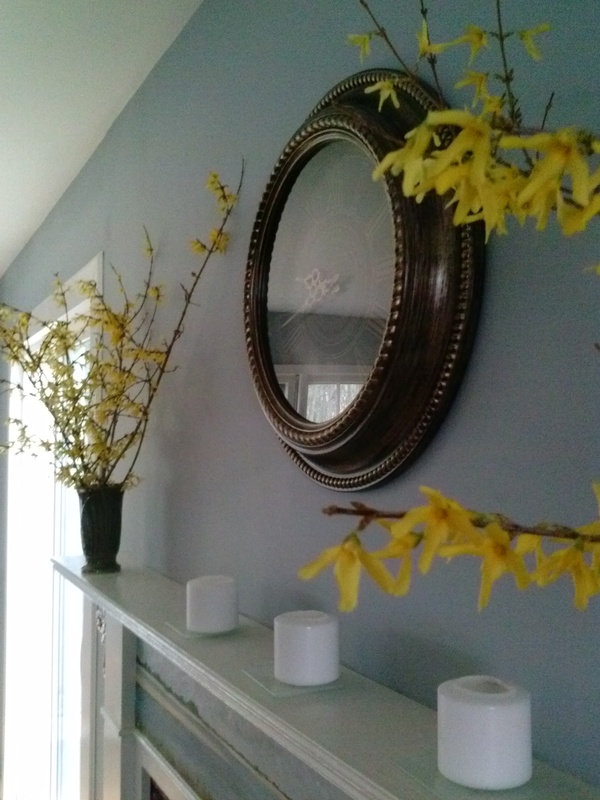 Early in my days as a gardener I learned how easy it was to force forsythia to bloom indoors. Snip some branches, stick them in a vase of water, wait patiently, and voila, blooms appear. Two weeks ago, I snipped some branches and placed them on my mantel. I was “done” with the spray-painted branches of winter that filled my vessels. Gradually, the closed buds have opened, revealing sunny blooms and bringing a smile to my face. Yes, spring will come! Even though the temperatures hover just above freezing for the next few days, I am filled with hope for what is to come.